On Saturday the weather gods handed down sunshine and stillness, and so after lunch I spent an hour wandering round our local ruins, trying to catch the best of the light. We take them for granted, of course, these ruins. They are practically on our doorstep, a few minutes walk past the Linden Field and down the Cutlins where the sheep are presently grazing. Even before you get there you can glimpse the ragged elevations of the 13th century priory church through the Corsican pines, the old sandstone with its strange quality of luminosity, no matter the weather. The less imposing doorway to the left of the archways leads to the library. This is not the original entrance but was added after the Dissolution when the priory remains were used as farm buildings. Above it soars the remains of the south transept, once part of one of the most imposing monastic edifices in all Europe. It’s hard to imagine the full scale of it now. Not only did Henry VIII’s dissolving crew do a good job in 1540, but the good citizens of Wenlock were quick to repurpose all that well cut stone. Most of the oldest houses in the town doubtless have some monastic stonework in them somewhere. This view from St. Michael’s Chapel (the Prior’s private place of worship) shows the southern edge of the church nave. The church originally extended to the far wall just in front of the trees (107 metres/350 feet). The stone stumps are the remains of gigantic columns, a matching arcade to the north side (out of shot). The remains to the right of the columns belong to the south transept. See next photo. St. Michael’s Chapel right, south transept centre, north transept left. And still it is hard to grasp the original scale of the place. The roof of the nave would have risen way above the south transept, the church forty years in the building. But now I’ve lingered too long. The shadows are gathering. My presence here feels like intrusion. Time to head home. 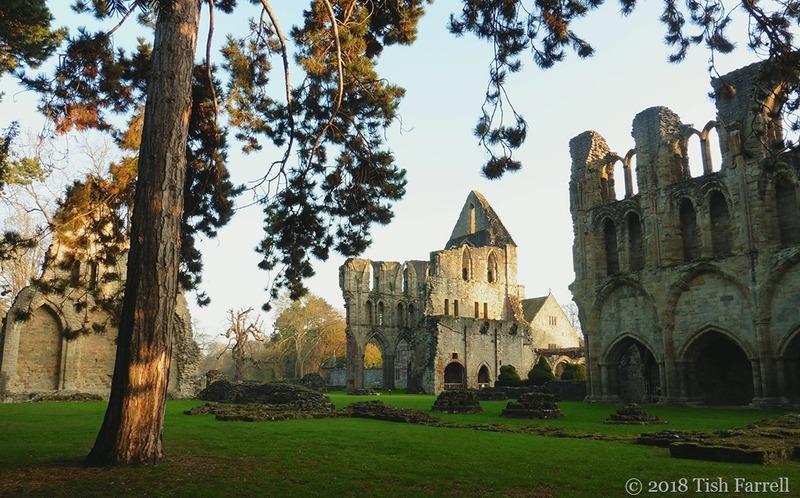 More about the priory’s history in an earlier post HERE. And for an account of Henry James’ visit to The Abbey see When Henry James Came to Wenlock. Lens-Artists: Doorways This week Tina gives us doors and doorways as the Lens-Artists’ theme. Please pop over to see her ever impressive work, and don’t forget to visit the other Lens-Artists. 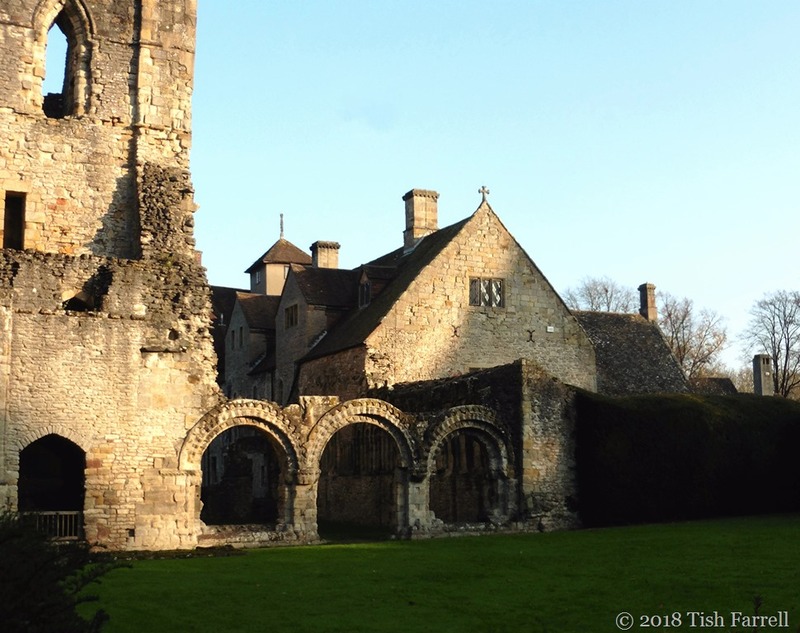 Posted on November 19, 2018 by Tish Farrell	This entry was posted in Uncategorized and tagged #Lens-Artists, Henry James, Much Wenlock Priory, Tish Farrell Writer. Bookmark the permalink. That must have been one impressive site, glad to hear the locals made good use of some of it! Not your house, though, right? Not a nefarious bone in the entire Farrell stock. Good photos as always . There is something both magical and sad about old ruins. I agree about the sad and magical of old ruins. Many thanks, Tina. Glad you liked my doorways. I remember it. I also remember you wondered what the bits of ruins were, and I have now consulted the guide book to discover that it was St Michael’s Chapel in the first three of your shots – upstairs that is, above the vaulted bit (there used to be a spiral staircase) – where only the Prior went to pray. The last photo is on the wall of the Chapter House – the monks’ meeting room. I love the light at this time of year. Beautiful, so glad you took the time to nip down the road for us! I would have enjoyed this outing. It was good. I had the place to myself too, for most of the time. Thank you for that very nice comment, Shimon. It is also a pleasure to me when you pick up my posts fresh from the keyboard as it were. As a one time student of prehistory and archaeology, I can only wholeheartedly agree that we need to keep some relics of the past around us. In fact we need all possible tools, probable and even improbable ones, to keep our perspectives honed; to see beyond the NOW and the ME; to look to the consequences past and future. I’m glad you like the photos. I spent a very happy hour just looking and being. Lovely light here Tish and the penultimate photo looks like a Constable painting. I shall be in Shropshire in a couple of weeks time so if you are not away for your Christmas holidays maybe we can meet up for a coffee or lunch or something. If I had a magnificent treasure like that in my (almost) backyard, I’d like to think I’d be visiting there all the time …. but I know how it is when something is close by. It does start to become almost invisible. However, I must say ‘wow! wow! wow!’. If the ruins are this magnificent, can you imagine what it was like when it was all intact?!! As usual, the depth of history you have available to you to visit boggles my mind. Yes, Joanne, we’ve come to think that ourselves – about calling in more reguarly. After 12 years of living in Wenlock, and 50 odd years of occasional visits there, we have finally joined English Heritage who manage the site, so we can go in whenever they’re open. 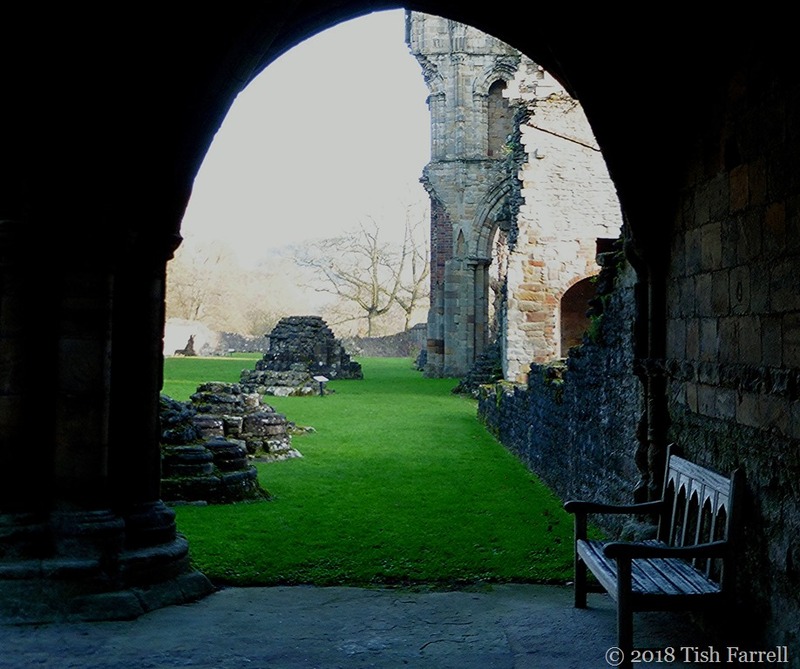 And yes, too, the original sight and scale of the priory in an isolated little Shropshire valley must have been truly astonishing. Yes, it was a wonderful light. Also I’m all for graceful ageing. Shame it’s often such a challenge for the human form. Beautimus, Tish. Love, love, love. We ARE, Jo. How are things going with you? I’ve been a bit absent from WP. A bit manic Tish 😃😃. The carriers arrived this morning so no more cardboard boxes. Out for supper with friends last night and lunch this afternoon. Just about on my knees 🍷💕 All ok at yours? Well done on the packing up. That must be a relief. Can tell a glass of restorative vino is called for though. And yes, all quiet on the Farrell front – me sewing, booking binding man, well, binding. 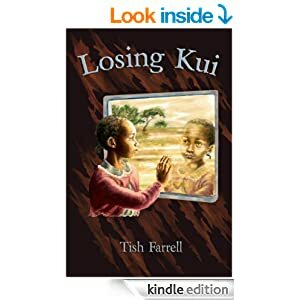 The sense of place must be mind-boggling, Tish – and your images are wonderful! Love the shots framed in the doorways, with the contrasting light. Wonderful light and beautiful placce to walk. Love those doorways to olden times. 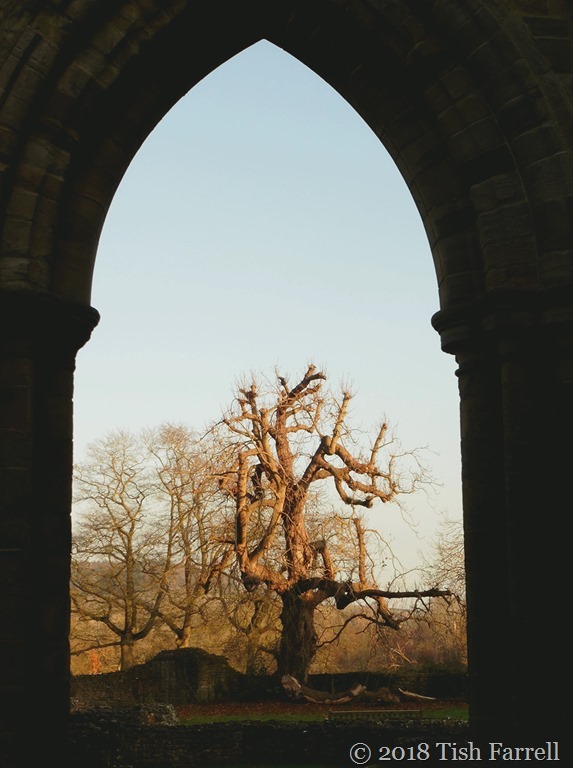 All gorgeous images but that arched doorway looking out to the tree took my breath away. The lighting is just right and the composition perfection! 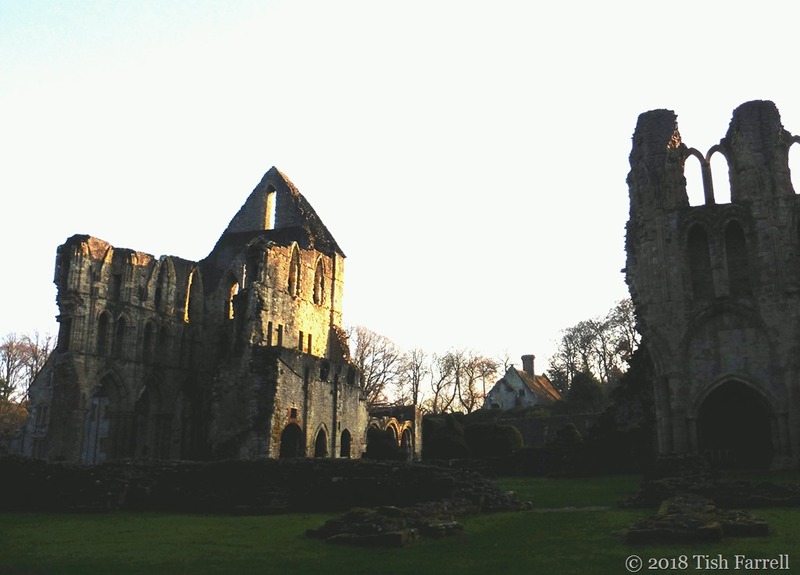 Thank you for taking me with you to Wenlock Priory! 😄 Even Durban, South Africa seems cold after a few years in the tropics. Fabulous captures, Tish! I’m in awe with the arch framed shot. What s wonderful old ruin. I can just imagine it at dusk. It must be rather spooky. It can indeed look spooky, but more abandoned than sinister.